GBPUSD has shown a minor jump of almost 100 pips in Asian session and declined after UK inflation report and BOE Carney dovish stance. The pair declined more than 900 pips from the high of 1.43767 level. The pair hits low of 1.3391. In May inflation report the BOE said that “CPI inflation is projected to fall back more quickly and interest rates will go up very gradually over next few years. BOE Governor Carney said there is residual softness in Q1 GDP data and also mentioned economy did not perform in line with Feb forecast. The rising US 10 year bond yield well above 3% also supporting GBP weakness. 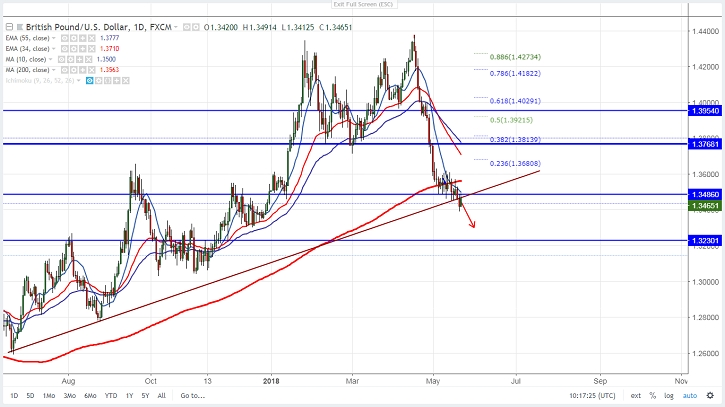 The pair hits intraday high of 1.34900 and near term resistance is around 1.3508 (10- day MA) any break above will take the pair to next level till 1.3560 (20- day MA)/1.3620. Short term trend is still weak as long as resistance 1.3620 holds. Any break above 1.3620 will take the pair till 1.3680/1.3760. The major support is around 1.3450 and any break below will drag the pair down till 1.3400/1.3350. It is good to sell on rallies around 1.3470-75 with SL around 1.3515 for the TP of 1.3400/1.3345.